Stocks closed a volatile month with strong gains on Friday on renewed bets the U.S. and China could strike a deal on trade. The Dow Jones Industrial Average rose 199.62 points to close at 25,538.46. The S&P 500 and Nasdaq Composite both gained 0.8 percent to close at 2,760.17 and 7,330.54, respectively. Stocks wobbled for most of the session until Reuters reported that a Chinese official said "consensus is steadily increasing" in U.S.-China trade talks. The official added, according to the report, that differences between the two countries remained. Jeff Powell, managing partner at Polaris Greystone Financial Group, said "if we can get some sign of progress, that will help." President Donald Trump and Chinese President Xi Jinping are scheduled to have dinner on Saturday and are expected to discuss trade issues between the two countries. Investors are eagerly looking ahead to the dinner, hoping the two leaders can quell trade-induced volatility in the global economy and corporate earnings. U.S. Trade Representative Robert Lighthizer said Friday he expected the meeting to be a "success," raising hope that a trade truce between the world's largest economies could be struck. Caterpillar and Boeing rose 4.2 percent and 1.2 percent, respectively. These stocks are considered bellwethers for global trade because of their high exposure to foreign markets. Trade has been at the top of investors' minds for most of 2018 as the assess the potential impact of a U.S.-China trade war on the global economy and corporate profits. WATCH: What is the difference between the G-7, G-8 and G-20? Friday also marked the last trading day of November. This month was a volatile one for Wall Street as investors grappled with trade worries as well as fears the Federal Reserve would tighten monetary policy faster than expected. Fed fears were eased slightly this week after Chairman Jerome Powell said rates were "just below" their neutral level, hinting at fewer hikes down the road. 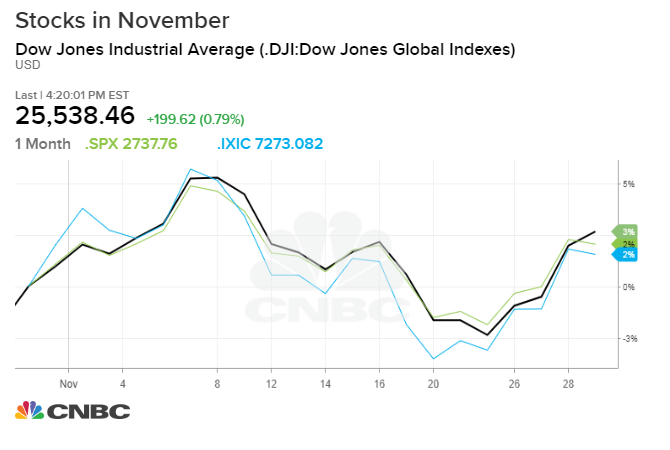 The S&P 500 closed November with a 1.8 percent gain, while the Dow rose 1.7 percent. The Nasdaq Composite, meanwhile, eked out a 0.3 percent gain. Heading into December, however, stocks could be in for more volatility, said Bruce Bittles, chief investment strategist at Baird. "We do not have evidence that a meaningful cyclical low is in place, and the character of any rally attempts that do emerge will be watch closely," Bittles said in a note. He added, however, stocks have historically done well in December. "December has a well-known history as being a strong month of the year for stocks," Bittles said. "In fact, it is the strongest month of the year for U.S. stocks on an absolute basis. Stocks have rallied over the course of the month about three quarters of the time." The Dow also registered its biggest one-week rise since November 2016, climbing 5.16 percent. The S&P 500, meanwhile, rose 4.85 percent this week in its best weekly performance since 2011. Shares of World Wrestling Entertainment closed 2.6 percent higher after J.P. Morgan Chase upgraded them to overweight from netural, noting the company's valuation is attractive compared to industry peers.